Note: Please submit the well-written and well-prepared manuscripts. It will help for a quicker decision on your manuscript. Click here. If you are not registered as an author then register yourself. The system will generate username and password for you after registration. You have to use this username and password to login as an author. After login, click on the tutorial link (present in upper menu). The tutorial will guide you procedure regarding submission of manuscript. Wait until the conversion to PDF is completed. It may take 2-3 min according to system speed and your network speed. Please do not forget to send the submission after conversion to PDF. After successful confirmation, you will receive the system generated acknowledgment by an email for your submission. It means the submission process is completed successfully. N.B. If you are new with online submission system, you may face problem in the last step! Click HERE and follow accordingly. Peer Review Policy: After receiving, manuscript will be primarily checked by the Editor-in-Chief. If the manuscript is not well formatted, it will be sent back to the corresponding author. If the content is not satisfactory or does not match the scopes of JAVAR, the manuscript will be sent back as rejected instantly. On passing the preliminary screening, the manuscript will be sent to at least two expert peer reviewers. A reviewer invitation from JAVAR is sent out by e-mail from ScopMed online system. Only title and abstract of the manuscript are included in the invitation e-mail. After accepting the invitation, the reviewer gets full access to entire manuscript. Information about the reviewers are kept confidential (closed). Decision on a manuscript is made by the Editor-in-Chief considering the comments of the expert reviewers. On an average, peer-review process is finished within 3 weeks. Decision is given within one month (average). A cover letter and the manuscript (main article) file (word file; 2007 or newer version) should be prepared before starting submission by online. Line and page numbers should be inserted starting from the beginning. The "cover letter" should include Message to the Editor-in-Chief, Title of manuscript, names of all authors with their affiliations and contact details including e-mail addresses, and details of corresponding author. First page is title page: it should include Title and statement of novelty (within 5 sentences). The ethical approval (if needed) should be mentioned. Main article file must NOT contain Names of authors & affiliations. This file will be sent to reviewers. The submitted manuscript or its essential content must not have been published previously or be under consideration for publication elsewhere. The Abstract should be brief not exceeding 150 words. The purposes of an abstract are to give a clear indication of the objective, scope, and results of the paper so that readers may determine whether the full text will be of particular interest to them. Each paper should have 3-6 keywords indicating the contents of manuscripts. The keywords are used for indexing, abstracting, and retrieval purposes. The Title should be short and informative. The introductory section should contain a brief review of the problem with which the study deals, validate the approach taken, and clearly formulate the goals. This section comprises full description of the object of the study (including Latin names), The original names of instruments and reagents should be specified, and the manufacturers name (company, country) should be given in parentheses. Please indicate the source from which the sample has been obtained. This section should provide a concise description of experimental data obtained, illustrated by tables and figures (which should not duplicate each other). Rather than mechanically repeating the data of tables and graphs, the text should seek to reveal the principles detected. It is recommended to use past indefinite verb tense in describing the results. Discussion should not reiterate the results. Tables should be typed as text, using either 'tabs' or a table editor for layout. Do not use graphics software to create tables. This section should be completed with a major conclusion that answers the question specified in the introductory part of the article. Please check the style carefully. Recent references (last 5 years) are expected. References older than the year 2000 should be avoided. References older than the year 1990 are not acceptable. Islam M, Hassan J, Khan MSR (2014). Seroprevalence of Mycoplasma gallisepticum infection in backyard and commercial layer chickens in Bhola district, Bangladesh. 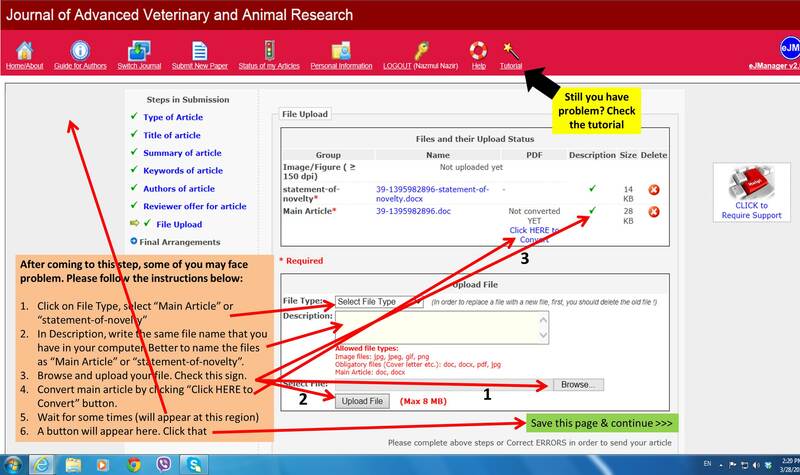 Journal of Advanced Veterinary and Animal Research, 1: 11-15. Urlacher VB, Eiben S (2006). Cytochrome P450 monooxygenases: perspectives for synthetic application. Trends in Biotechnology, 24: 324330. Shimada T (2006). Xenobiotic-metabolizing enzymes involved in activation and detoxification of carcinogenic polycyclic aromatic hydrocarbons. Drug Metabolism and Pharmacokinetics, 21: 257276. Deppe G (1998). Chemotherapy of Gynecologic Cancer, 2nd Edn. New York: Alan R. Liss; pp 297308. Cabana BE (1994). Bioequivalence and in vitrotesting of drug formulations. In: Towards Better Safety of Drugs and Pharmaceutical Products (Brenner DD, Edn.). Amsterdam: Elsevier North-Holland Biomedical Press; pp 301322. Case report should contain-abstract, keywords, case history, clinical examination, treatment/surgery/management, discussion, conclusion, acknowledgement (if any), and references. Recent references should be used. JAVAR does not charge any submission fee. N.B. Up to Vol 1 Issue 4 (December 2014), JAVAR published articles free of charge. Upon submitting an article, authors should be agreed to abide by an open access Creative Commons license (CC-BY-NC). Under the terms of this license, authors retain ownership of the copyright of their articles. However, the license permits any user to download, print out, extract, reuse, archive, and distribute the article, so long as appropriate credit is given to the authors and the source of the work. The license ensures that the article will be available as widely as possible and that the article can be included in any scientific archive. Experiments with animals should be done in accordance with the legal requirements of the relevant local or national authority. Manuscripts describing any experimental work with laboratory animal or bird should include a statement that the Ethical Committee of the institution in which the work was done has approved it. Papers should include details of the procedures and of anaesthetics used. The corresponding author must declare in the cover letter that the manuscirpt has not submitted to any journal for possible publication, or has not published elsewhere (in part or full). If we notice such kind of malpractice, the author(s) will be blacklisted for our journal, and no article from those authors will be processed in future. Besides, the list of authors may be forwarded to the editors of other related journals around the world.